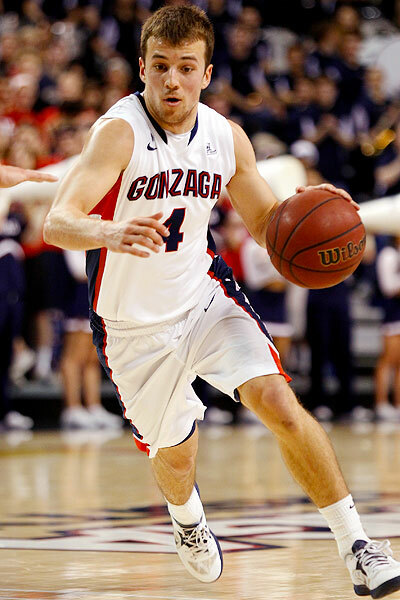 Yesterday, Ken Pomeroy sent out several tweets about Oakland's Travis Bader. At this point, no one should be surprised that Travis Bader showed no signs of having a hot hand. Pomeroy showed that Bader's 3P% actually went down after making a shot, likely because of overconfidence leading to poor shot selection. At this point, study after study has made the numbers behind the hot hand pretty clear. Someone who shoots as frequently (and as well) as Bader is obviously going to make a bunch in a row multiple times in a season. Still, there is just no evidence that these streaks go beyond what we would expect from random variation. Pomeroy's tweets inspired me to take a different look at this topic. I decided not to look any further at if the hot hand actually exists, but instead to look at if the perception of the hot hand actually influences decision making. With this in mind, what better player to take a look at than Marshall Henderson? Last season LeBron James tweeted that Marshall Henderson had, "The greenest light in basketball history!!" LeBron was pretty accurate with his tweet. Henderson finished just one three point attempt shy of tying David Holston's record for the most in a season (stats going back to 1998). Henderson's has a reputation for being a streaky shooter with virtually no conscience on the court. I decided to leave that first part aside. I pretty much already knew what the numbers were going to say about his "streaky" shooting. I think the more interesting thing here is his conscience. The question being: Did Marshall Henderson play differently depending on his most recent result? This table is simply Henderson's decision making, NOT his results/efficiency. Henderson was surprisingly a completely different player depending on what he had done last. After making a three, his next used possession was another three point attempt 72% of the time. After missing a three, his next used possession was another three point attempt just 38% of the time. Statistics say that Henderson wasn't actually hot or cold during these times, but that doesn't mean perception still doesn't play a MAJOR role. After missing a three, Henderson turned into more of an aggressive "playmaker". He stopped taking so many outside shots and instead drove to the rim at a higher rate, drew fouls at a higher rate, assisted at a higher rate, and turned the ball over at a higher rate. After making a three, Henderson was a one dimensional player. This seems like it might be valuable information for opposing defenses. I think it's safe to say that defenses also react to the "hot hand" by giving less space. Clearly Henderson felt they didn't adjust enough, he let 91 threes fly out of his 126 total plays following a made three. Finally, the middle/white row shows Henderson's decision making on his first used possession of a game or after being subbed back into a game. These numbers are a near perfect middle ground. Think of this row as the "rational" Marshall Henderson. Have those last three words ever been used together? By rational I mean that emotion is (probably?) less likely to significantly influence his play. We think of Marshall Henderson as someone "who is never afraid of shooting from anywhere on the floor". This seems to simply off based. The hot hand might not exist, but players believe in it. Even Marshall Henderson has a conscience. It's August 11th, which means college basketball is right around the corner! I'm kidding... sort of. The first games can't get here soon enough so I decided to take a stab at the top 25 teams entering the 2013-14 college basketball season. In most years, when the defending national champions only lose two of their top eight players, they enter the year favorites to repeat... This is not like most years. The Louisville and Kentucky storyline is shaping up to be the marquee story entering what could/should be a hallmark year for college hoops fans. What will Russdiculous do for an encore? As Jon Rothstein says, "Death, taxes, and Kansas winning the Big 12." The players may change, but Bill Self, Kansas, and winning do not. I think you can count on these Jayhawks to be Big 12 champs once again with Andrew Wiggins and Wayne Selden leading the way. Having only lost graduating Senior Derrick Nix, these Spartans have a lot of ammo at Tom Izzo's disposal. The question that's begging to be asked: will either Adreian Payne or Gary Harris take "the leap" and emerge as their go-to guy? How second year players Kaleb Tarczewski and Brandon Ashley carry on the momentum they created with their strong finishes last year, will determine much of this Wildcats teams faith. T.J. McConnell is a big-time pickup to run the show for Sean Miller's squad. Is Aaron Gordon as good as they say, and will he play the 3 or 4? A KenPom favorite from last year who lose their top three scorers, this squad should be underrated entering the 2013-14 season. I expect Patric Young to take a big step forward this year. Couple him, the well-rounded play of Scottie Wilbekin, Will Yuguete's stifling defense and a strong incoming freshman class and Billy Donovan's crew won't go down without a fight. Without their top 3 scorers from a season ago, can this offense remain potent? Duke also loses their top three scorers from a season ago but have standout freshman Jabari Parker to lead the way. I think the key question is without the shooting of Seth Curry and Ryan Kelly, will Duke's offense be able to be nearly as efficient? Rasheed Sulaimon needs to build on his strong freshman season. 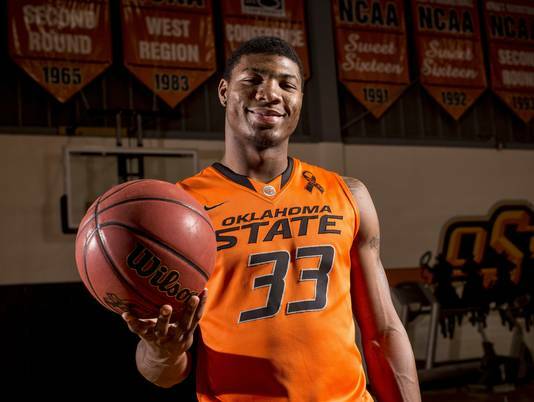 In Marcus Smart I trust. Smart has gambled on himself before and won, and I expect him to do much of the same this year. Smart and LeBryan Nash form as formidable a duo as we will see in college hoops next season. Will the men in Stillwater be able to dethrone their rivals in Lawrence? 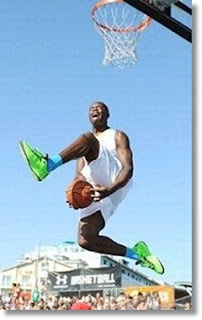 Assuming PJ Hairston can keep out of trouble, UNC will be explosive next season. After their late season success switching to a predominantly three, and often four, guard offense, I expect them to do much of the same next year. I think UNC, Duke and Syracuse will be battling it out all year to determine the champions of the new-look ACC. UPDATE: Hairston suspended indefinitely, and obviously hurts the Tar Heels. The Huskies lose no key contributors from a team that went 20-10 and surprised many in Kevin Ollie's first season. Now that they are NCAA tournament eligible, I expect another big jump from UConn in year 2 of the Ollie regime. Tough to find a better backcourt in the country than Shabazz Napier and Ryan Boatright. I am likely higher on this team than most. In recent years, Jim Boeheim's bunch has just reloaded rather than have to rebuild. Even with the losses of James Southerland, Michael Carter-Williams, and Brandon Triche, expect much of the same from the Orange. 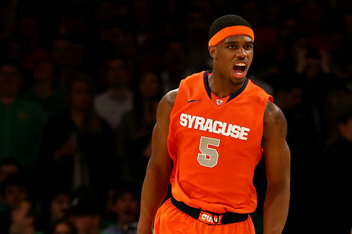 A frontline of CJ Fair, Jerami Grant, DaJuan Coleman, Rakeem Christmas, and Baye Keita may be the best in the country. How will this bunch fare (no pun intended) in a new conference? Without Deshaun Thomas, I think a lot of pundits have this team a little too highly ranked for next season. Unless Aaron Craft takes a major step forward offensively, Lenzelle Smith and LaQuinton Ross could be asked to shoulder a ridiculous scoring load. However, I would not bet against Thad Matta, as all that man does is win. Glenn Robinson III and Mitch McGary will keep this team competitive and afloat coming off a run to the National Championship game. I would imagine the media polls will overrate this team at the beginning solely because of that run, but this is still a solid squad nonetheless. Nik Stauskas can flat out put the ball in the basket. Having one of the best, if not the best, scorers in the country coming back for their senior campaign cannot hurt. I expect another monster year from Doug McDermott. The Team USA Mini-Camp experience showed McDermott can score at any level. Grant Gibbs being granted a sixth year of eligibility makes this as potent a Blue Jays team in quite some time. The key will be defensively: can this team get stops? Siyani Chambers was somewhat of a revelation last year as the Ivy League Freshman of the Year. He stepped up in a huge way after the losses of Kyle Casey and Brandyn Curry. With those two back in the fold, and Wesley Saunders having taken a huge step as a Sophomore, I expect this to be a monster season for the Crimson. They have arguably the best Ivy League roster in recent memory. Returning four of their top five starters, and motivated after a relatively early exit in the NCAA Tournament, I expect this VCU squad to go far when March rolls around. Spearheading the havoc on the defensive end will be Briante Weber, and offensively, Treveon Graham, Juvonte Reddic, and Rob Brandenberg all should take next steps in their development. Jeronne Maymon returning to form after injury caused him to miss all of last season will be the biggest question this team has to answer. If he is healthy, the combination of him, Jordan McRae and and Jarnell Stokes should leave the Vols fighting with Florida as the second best team in the SEC. It seems like Memphis has fallen short of expectations basically every year under Josh Pastner, but the results and stats show that is simply not true. Fresh off a 31-5, (16-0) record from a year ago, this squad heads to the AAC looking for similar success. Much of that success will rest on the shoulders of Joe Jackson and Shaq Goodwin. Year in and year out, Buzz Williams' bunch is resilient. I expect this year to be no different. Gone to supposed greener pastures is Vander Blue, but someone must step up in Milwaukee. Will that man be Todd Mayo or Junior Cadougan? Or post player Davante Gardner? Every key player returns from last year's team. I am a firm believer that teams that do not lose anyone from an underachieving, or not very good team, always enter the following year underrated. I think Iowa is a prime example. The Big Ten won't be as good as it was last year, and these Hawkeyes will be right there ready to make some noise, led by Aaron White and Roy Devyn Marble. Is Mike Moser enough to swing the balance of power in the Pac-12 over to these guys in Eugene? Coupled with the continued development of talented freshman Dominic Artis, Willie Moore, and Damyean Dotson, I believe so. And a trend has occurred in recent years regarding the Pac 12: everyone is always so quick to state how overrated and pathetic the conference is, that by the time the tournament comes around the top teams in the conference are somehow underrated. 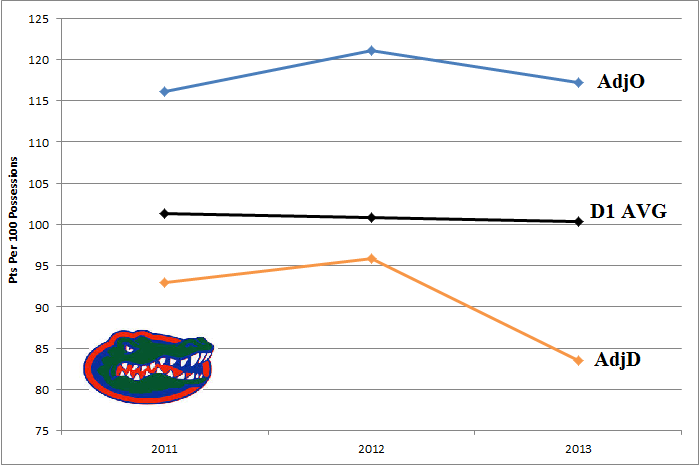 As the case in three of the past four years, with Oregon last year, and Washington in 2010 and 2011. Annually, two things usually occur regarding these guys: they are one of the computer's favorite teams/darlings due to their style of play, and the media underrates them at the beginning of year. Still trying to figure out how or why the ladder occurs, considering this team has never finished worse than fourth in the Big Ten during the Bo Ryan era. Bo Knows Basketball. Kevin Pangos will need to take that next step and establish himself as a legitimate WCC POY candidate for this Bulldogs team to make a deep run in March. Not landing either Mike Moser (UNLV) or Josh Davis (Tulane) as potential transfers who were interested in heading to Spokane hurt this team as they lack front court prowess. This team loses an awful lot from one of the nation's best teams a year ago. Can Yogi Ferrell and Will Sheehey become two of the top players in the Big Ten and lead the charge? 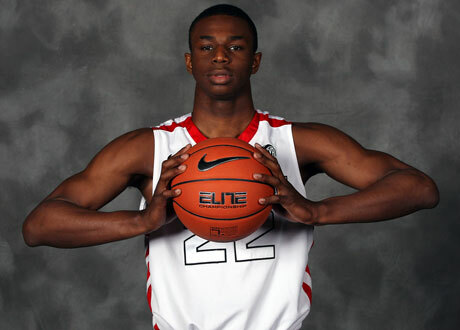 Noah Vonleh needs to be able to adapt to the college game quickly if Indiana intends to compete with the forces at the top of this conference. Lots of questions to be answered in Bloomington. One of the nations most disappointing teams just a season ago, returns Kyle Anderson, Jordan Adams and the Wear twins. Finding a position and role for Kyle Anderson will be one of the Bruins main questions heading into the season. "If you don't like watching teams turn the ball over, Bucknell games are the ones for you. If you think about this strategy a little deeper, it's a very odd concept. On offense, Paulsen stresses not turning the ball over and not crashing the glass (presumably to focus on getting back on defense). On defense, Paulsen forces his opponents to use the same exact strategy he uses! If Paulsen believes taking care of the ball and getting back on defense is the best way to play basketball, why does he enable his opponent to do exactly that? The answer here is probably that he believes that Bucknell can play Bucknell basketball better than their opponents play Bucknell basketball. Confusing, I know." There's no one absolutely correct way to coach a basketball team. There's a trade-off involved in every four factor. For example, you can increase your shooting percentage by being more patient and passing up looks to get a better shot. However, this would in turn increase your turnover percentage. The Dave Paulsens and Bo Ryans of the world choose to make their opponent play their brand of basketball. In this post, I tried to quantify the top 10 most "consistent" coaches in the country and the top 10 most "contradicting" coaches in the country (i.e. - Paulsen). First, I looked at teams in the top 100 in both offensive efficiency and defensive efficiency in the 2013 season. I didn't want talent to be a major factor and the coaches of bad teams aren't a good fit for this analysis. 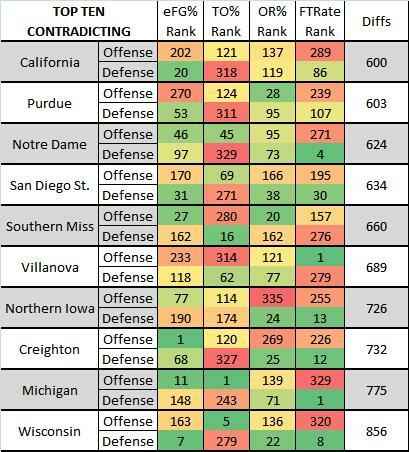 With 61 eligible coaches remaining, I simply subtracted each four factor defensive ranking with the corresponding four factor offensive ranking. By adding together the absolute values of these four differences, I developed a very basic metric to measure coaching consistency. If my explanation is confusing now, the charts below should clear things up visually. 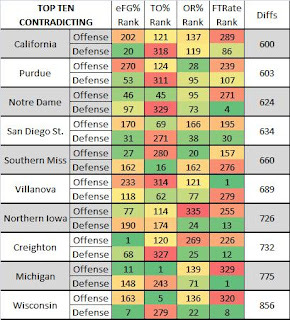 In 2013, Bill Self had the most consistent strategy and Bo Ryan had the most contradicting. It should be noted Bucknell did not qualify, because their offense was not in the top 100. The tables help visualize the concept. 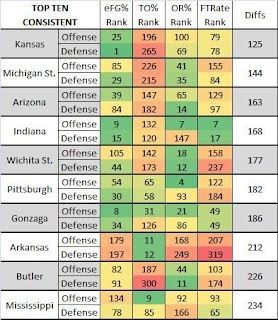 Take a look at Kansas' coloring on offense and defense in the four columns. KU's offensive and defensive ranks are essentially the same. Now look at Wisconsin. Where there is green there is red and where there is red there is green. The list of most consistent coaches is loaded with coaching stars: Bill Self, Tom Izzo, Tom Crean, Mark Few, Brad Stevens, etc. However, it's by no means a bad thing to be on the right. John Beilein nearly won the national championship with a contradicting strategy (first in the country at not fouling, 329th in drawing fouls!) 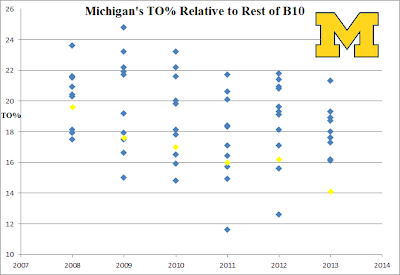 and Bo Ryan has had amazing success with his style of play. If anything, this shows how many different ways there are to win at the college level. I had a blast researching and writing at Hoop Vision this season. With the 2012-13 season in the rear view mirror, I put together a post of some of the best content from the site this season. I'll be back with new stuff in mid to late May looking at both the NBA Draft and general basketball research. I have several exciting opportunities for next season in the works, so there might be more information on that in the near future. Regardless, Hoop Vision will absolutely be kept alive going forward in some capacity. With just over an hour left until the final college basketball game of the 2013 season, I give you one last look at Michigan and Louisville. Michigan comes in with the number one ranked offense in the country, Louisville comes in with the number one ranked defense in the country. Obviously the reason Louisville is favored is their "weakness" (offense) is better than Michigan's "weakness" (defense). Weakness is in quotes, because this is relatively speaking. It's difficult for a team to make it this far with a truly big weakness on either offense or defense. Louisville's offensive performances in their five NCAA tournament games have been some of their best of the year. Michigan struggled some on defense against Kansas and they will need to be great tonight in order to cut down the nets. Earlier this week I wrote about what I call opponent "compatibility". I basically wanted to know if there was any evidence for bad matchups beyond simply the general strength of the two teams. Now, I decided to use that same sample to take a look at the Louisville-Wichita St game today. My sample includes every game from the 2009, 2010, 2011, and 2012 season. It also has 2013 games from up until the first week of March. In every single case, the offense shot the ball at a high percentage. 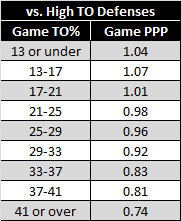 There has been a lot of focus on if Wichita State can take care of the ball against the Louisville pressure. 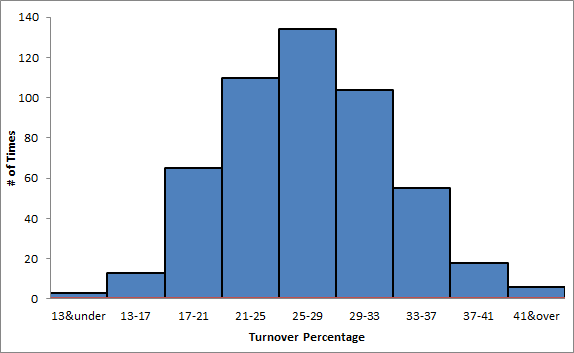 However, the recipe for success for teams in the Shockers' position has been to get hot from the floor and keep the TO% on a manageable (low to mid 20s) level. Easier said than done against Louisville.